We aim to make our Waxing Treatments as comfortable as possible whilst helping you to feel at ease and protecting your modesty. Our Therapists are highly skilled waxing specialists and will deliver your treatment in a clean and professional manner. Professional Waxing Treatments have brilliant results leaving skin smooth and hair free for up to 4-6 weeks. We use a combination of Hot Wax and Tea Tree Antiseptic Strip Wax. Hot Wax is applied whilst hot and removed when cooled. It forms a tighter grip on the hair compared to Strip Wax, and grips the hair rather than the skin making it more comfortable for intimate areas. Strip Wax is applied warm and removed with a fabric/paper strip. It is a quick and efficient method for covering large areas and is suitable for clients with heat sensitive skin. Please talk to your Therapist if you have a preference. Allow at least 1 week, preferably 2, between any shaving/depilatory cream use and a waxing treatment. This is to ensure hairs are of a sufficient length to be removed at least 4 mm-however the longer they are the less it hurts! We recommend around 1 cm. 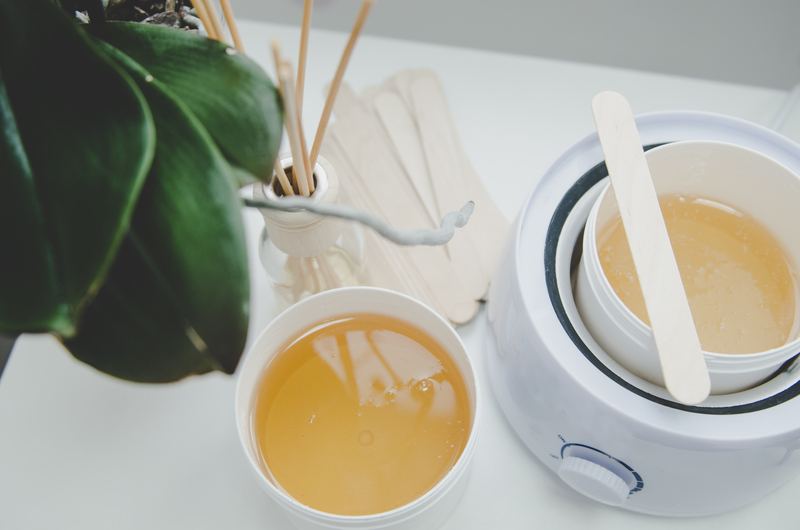 We usually recommend a 4-6 week interval between successive wax treatments. Regular waxing over a prolonged period can significantly reduce future hair growth. For more information of pre/post waxing care, please see our aftercare page. Electrolysis is a method of removing individual hairs from the face or body. Today’s medical devices destroy the growth centre of the hair with heat energy. A very fine probe is inserted into the hair follicle and removed with tweezers. Hair growth is the result of hereditary and hormone levels, also some drugs, temporary methods of hair removal and illnesses can stimulate hair growth. Electrolysis is very popular alongside Laser treatment to tackle white/ blonde hair that are resilient to the laser. Please refrain from using body lotion or moisturising body washes on the day of your waxing treatment as they may prevent the wax from being applied and removed efficiently. Wear old high-cut briefs for Bikini, Brazilian and Hollywood Waxing treatments. Please note that any fake tan will be removed when the area is waxed. No lotions to be applied for 24 hours after waxing treatment. This includes deodorant, perfume, self-tan, moisturiser, body wash and shaving gel – these could block pores and cause irritation. No heated treatments i.e. sun beds, saunas or swimming.